As the state’s largest advocacy organization for lesbian, gay, bisexual, transgender, and queer (LGBTQ) Coloradans and their families, we’ve worked hard for the legal and political advancements we’ve achieved. And – there’s still so much work to do. As many of us know, legal equality and representation in elected offices does not eliminate the lived equality gap that affects many of us in our day-to-day lives. We are excited to announce our 2019 One Colorado For All Statewide Tour with seventeen stops all across the state, taking us from Grand Junction to Fort Collins, from Steamboat to Alamosa, from Pueblo to Aspen. We’ll bring you up-to-date on the equality landscape in Colorado, the latest victories in the advancement of LGBTQ rights and protections, and chat about what’s next in ensuring a more fair and just Colorado for all. We’ll also be looking for you to tell us about the work that has been happening in your local communities, and discuss local opportunities to bridge the gaps between legal and lived equality. 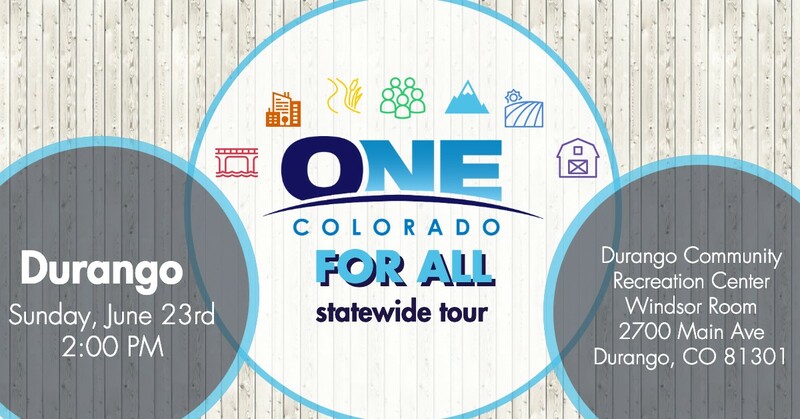 Mark your calendars now and sign up for the 2019 One Colorado For All Statewide Tour – Durango.